This buffalo has all four legs white and on its head it have a white patch. This buffalo have patches five places on its body thats why it is called Panchkula (a place in Punjab) which also means five irrigation canals. 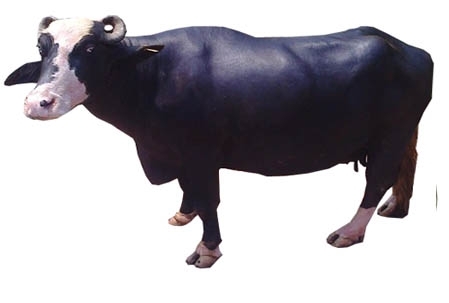 This is a riverine type of water buffalo and its main homeland in Pakistan and it is found it Punjab (India) as well. 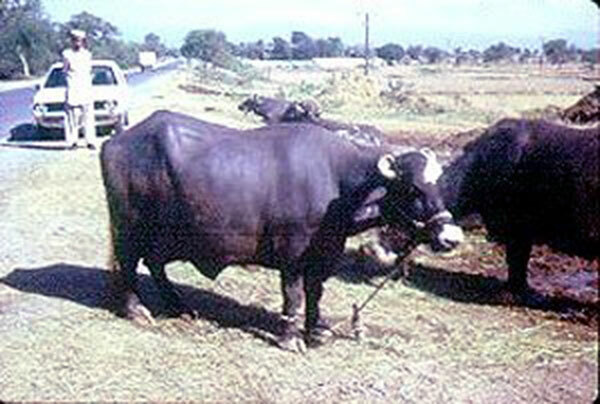 This Raavi breed looks like Murrah breed but produces less milk than Murrah. On an average they produce 10 litre of milk per day but the animals producing 20 litre are in common. Their maturity is over three years. They keep on calving for about 10 lactations however some animals may also calve for 14 times. That is they are vey much productive for about 20 years. They done suffer of Foot & Mouth disease like in exotic cattle. They also do not suffer of mad cow disease. These animals suffer of pulmonary infection i.e. hemorrhagic septicemia (HS). HS used to kill many buffalos, however now vaccination is available to protect from HS. These animals are water loving, they love wallowing. It is for this reason that these animals are safe in floods for many days. Their males, have been used in draft and transportation without castration. So these males are used for breeding purpose as well.